The Regional Center for STEM Education at Bloomsburg University (BU) will be holding its fifth GI-STEM (Girl In Science, Technology, Engineering, Math) on Saturday, April 13, 2019 in the McCormick Center for Human Services building on the University’s campus. 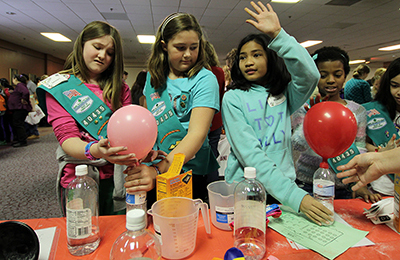 The day was created to encourage young girls to look at the world around them with inquisitive eyes, to become natural scientists, and to explore the fascinating world of STEM by allowing the scouts to move through a variety of hands-on STEM stations. All girls in 2nd through 8th grades from regional schools are invited to attend! Keep checking back for additional information. Registration is required. Please note: One parent or guardian is expected to remain with the girl(s) for the entire event. Take a minute and think about everything that you used today. Most (if not all) of these things are here because someone in the STEM field imagined it, created it, and produced it. Now it’s your turn! Put your imagination and creativity to work through an interactive summer camp, workshop, or program at Bloomsburg University! Students who get to participate in STEM activities at an early age are more apt to choose a STEM major in college. Yet in Pennsylvania, as in most states, elementary school children will get less time to participate in science than they did 15-20 years ago. The average number of hours that first through fourth graders receive instruction in science is 2.6 hours per week and only 22 percent of eighth graders have five or more hours of weekly science instruction. There are many hours of exciting and fun opportunities at Bloomsburg University to experience the fascinating world of STEM activities through programs, workshops, and camps. Check out our summer camps, day camps, and other workshops available for students in elementary, middle, and high school. May 20-31, 2019 - The STEM Education Center provides an adventurous avenue for area schools to develop their students' science, technical, engineering, and math interests and abilities! These daily experiences runs Monday through Friday from 9:00 am to 2:30 pm. There is no charge to schools for the camp although students must bring their own lunches and schools must provide transportation. Many of the dates are already filled, but there are some openings yet. to register depending upon the size of the student group for Summer 2019 camps. Each day campers learned about all four STEM topics. Hands-on fun with rocks, geography and the environment. Campers learned how to use data loggers to examine chlorophyll and photosynthesis with plants in the field and lab. Science and math skills to investigate the world from DNA finger printing and brain waves to environmental biology. Campers brushed up on math skills through fun activities. Discovered how to use computers to investigate crimes, create programming and decode encryption. Campers honed their math skills for high school and college as they worked to master the world of technology. October 29, 5-7 pm - Area students did fun activities to solve a wicked crime! Attendees dressed up in costume to see who could be the best S(cience) T(echnology) E(ngineering) A(rts) M(ath) detective! Saturday, April 7, 2018 - Bloomsburg University’s Regional STEM Education Center hosted over 280 Brownies, Junior and Cadet Girl Scouts from 37 regional troops and 2nd through 8th grade girls from local school districts for its third GI-STEM: Girls In Science, Technology, Engineering, Math Day, where the scouts explored the world of STEM through 12 different hands-on stations directed by education and nursing majors. Clyde Peeling's Reptiland and Bloomsburg Airport had an presentations for the girls and the Mad Science of Lehigh Vally and Girl Scouts STEM-Mobile had an exploration stations. GI-STEM was created to encourage girls to look at the world around them with inquisitive eyes and to become natural scientists.